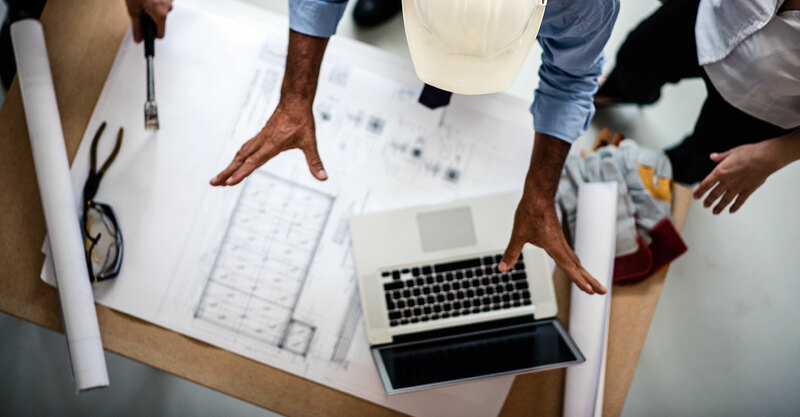 BidScaler is designed for general contractors, owner’s representatives, construction managers, and owner-builders who need to solve their scope of work specification problems without implementing a massive new software system. We’ve created a powerful tool by combining bid instruction software and scope of work content together. This is the solution to a costly business problem – preventable gaps in scope. Get your scopes working for you! Working within a cloud based, flexible and easy-to-use platform, you are able to create customized scopes of work for each subcontractor in just minutes. Check out some of our powerful features. BidScaler’s main dashboard is intuitive and easy to navigate. Simply select the project you are working on, and then choose from the list of bid packages to begin. 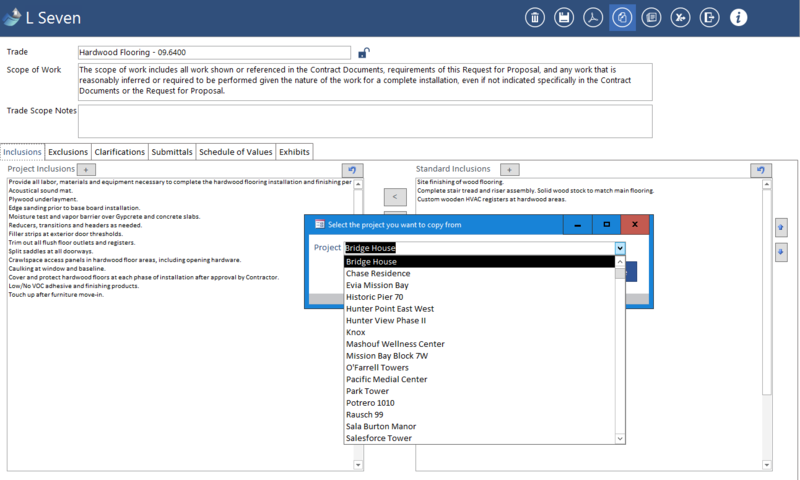 Add standard subcontractor scope inclusions, exclusions, clarifications, which are automatically filtered to the trade scope in order to make building your bid instructions fast and easy. 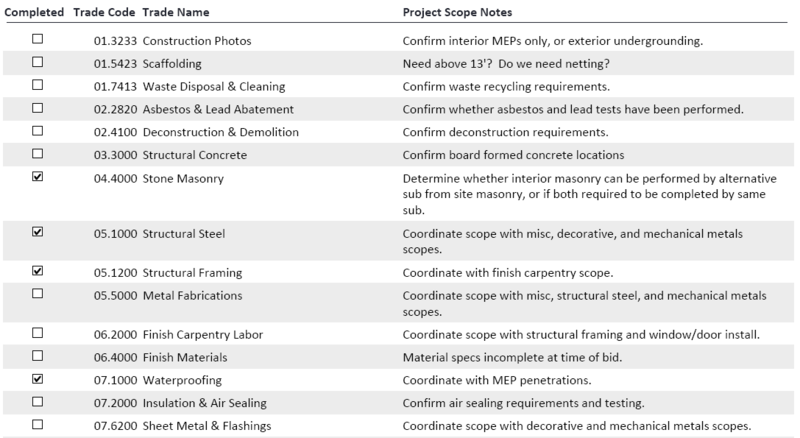 Imagine an incredibly thorough construction bid template for every subcontractor trade that you need to invite to bid. Keep your database clutter free by easily adding one time, project specific work scope items. If you find you have been adding the same subcontract specific note for multiple projects, save it for future use in your database. BidScaler is flexible software built by a leading general contractor for the subcontractor bid instruction solution general contractors need. Have a scope of work from a past project that is similar to the one that you’re working on? Rather than starting from scratch, copy the project scope and start customizing the current project from there. Copying scopes instantly carries over the inclusions, exclusions, and clarifications from the comparable project. BidScaler is here to save you time and reduce the chance of accidentally skipping or duplicating a key work scope requirement. 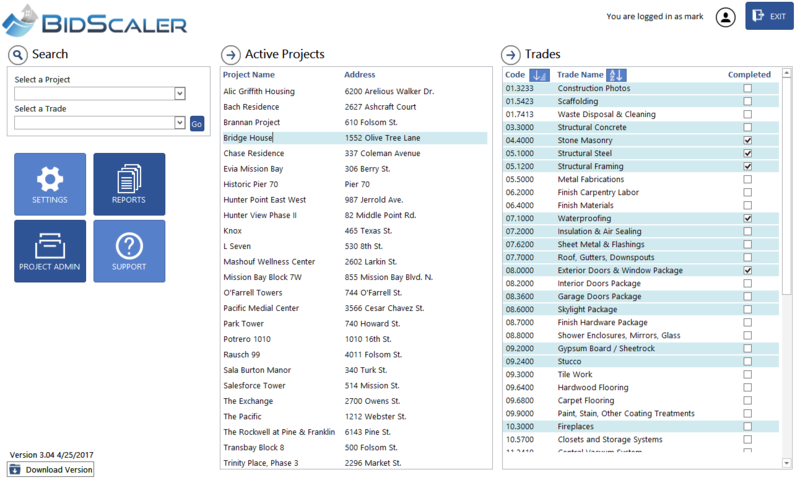 Easily communicate bid package exhibits to subcontractors with BidScaler’s powerful exhibit module. Attaching exhibits to either a specific bid package, or with one click attach them to to all trades in the project scope. 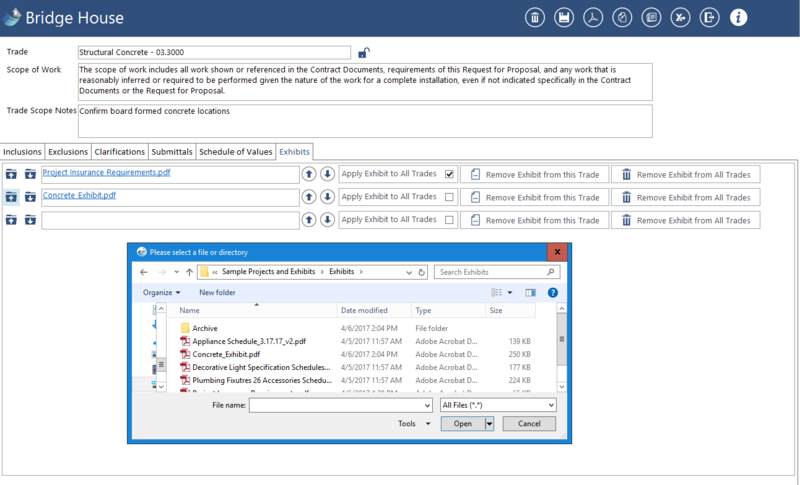 BidScaler can handle any size or number of PDF documents; it automatically organizes and binds exhibits with the trade package for one source of bid instructions. Quickly view the status of any project scope drafting progress with our built-in reporting. The job status report provides feedback to show scopes that have been started, have not been started, and that are complete. Easily communicate updates to your team with internal trade scopes notes and follow up items. 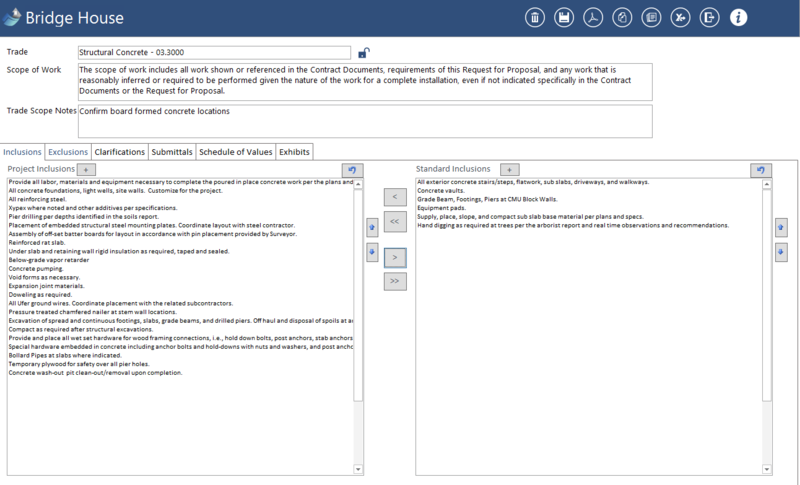 When you’re done creating the scope of work, lock the bid package and export it as a PDF. Send the bid instructions to your subcontractors via email or issue them via invitation to bid software. 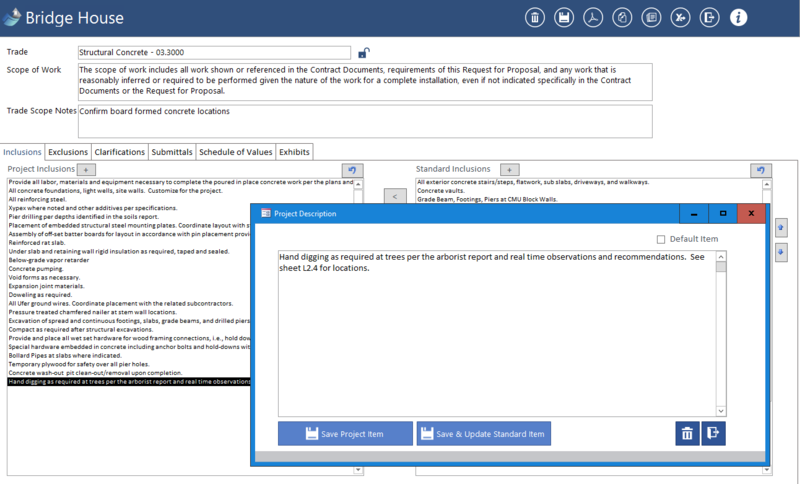 Easily convert Bid Instructions into Work Scope attachments to your subcontracts. Get the tool every general contractor is asking about and see why BidScaler is the quickest and easiest way to create accurate bid instructions and subcontract scope attachments!